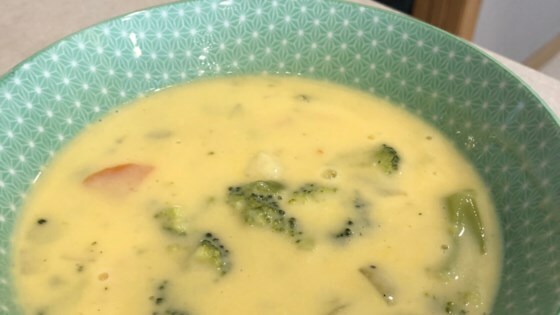 "A simple but satisfying soup. No exotic ingredients, just plain good." In a large pot over medium high heat, dissolve the bouillon in the beer and water. Add the potatoes, celery, carrots and onion, mix well and allow to cook for 15 to 20 minutes. Stir in the cauliflower and broccoli mix, and heat for 10 more minutes. Finally, add the condensed chicken soup and the cheese. Reduce heat to low and allow the cheese to melt, stirring often. Earthy, comforting cauliflower soup is topped with light, cheesy fritters. I replaced 3 cups of the water with milk (who uses water in a creamy soup?? ), left out the broccoli and cauliflower and used about 1/2 a Cup onion. Turned out perfectly!